It's less cool than Season 1. That 2015 run had been a "run out and tell your friends now" blast of awesome. These 2016 episodes, in contrast, are good. Neither bad nor stunning. They're good. They get a bit slow in the final stretch, but fortunately they save themselves with the ending. Koro-sensei is a gloating superintelligent octopus that can fly at Mach 20, is immune to conventional weapons and is going to blow up the world in March. In the meantime, though, he's working at Kunugigaoka Junior High School! He's the new teacher for Class 3-E and he takes this job very seriously. When he arrived, his students were the school's designated losers, but now he's taught them self-reliance! Discipline! How to inspire yourself and have fun! Plus of course lots of assassination techniques as they try to murder Koro-sensei and save the world for a 10,000,000,000 yen bounty! What made Season 1 fun was the attempted assassinations. I've counted. Nearly half the episodes have someone trying to kill Koro-sensei and half the rest pit his students against other assassins. This probably doesn't sound like a good thing. In fact it's great, because Koro-sensei is one of anime's greatest characters and there's very little in this world quite as funny as seeing him wipe the floor with his would-be murderers. It's not just that he keeps outwitting them, while also being a childish goofball and laughing his "nurufufufufu" laugh. He also educates them. He's a teacher. He'll brush their hair, shine their shoes and make them better people, while giving them tips on how to improve their chances of killing him next time. Season 2, on the other hand, is mostly free of assassination attempts. Koro-sensei isn't the star of the show. I mourned this, but it was inevitable. It's obvious by now that almost nothing can even slow down Koro-sensei and there was no future in trying to drag out the Season 1 formula of endless murder attempts. That would have got old. We've seen it before. We know how it's going to turn out. I thus agree with the shift of focus on to the students, even if the result is a less entertaining show. It's inspiring. Koro-sensei loves his students and really cares about teaching. They love him in return, even though they're trying to kill him. I still approve of this show, though. The reduced focus on Koro-sensei I can live with. 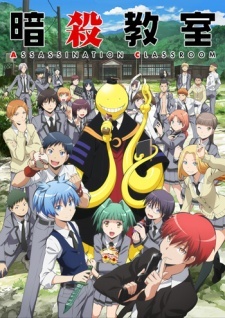 Even lesser Assassination Classroom is still better than most shows can hope to reach. I love Koro-sensei's backstory. He's trying to amend for his past mistakes. I like the tension with Nagisa, who's both a nice, gentle boy and a stone cold killer. Which is the real him? Both of them? At one point, he's considering "assassin" as a future career. It's worth pointing out, though, that Karma was getting nervous of him long before Koro-sensei showed up. Above all, though, they nail the ending. It's perfect. I had no idea beforehand how this show was going to end, but afterwards, I thought they'd got it exactly right. It had to be like this. I'm not fussed about Season 2 being a bit slow in places and not being as cool. The ending makes up for it. This show is funny, heartwarming and, when it clicks, as cool as hell. You'll prefer Season 1, but I think you'll still agree that Season 2 is good.